"WEB-TOURISMUS" was founded in 1998 as an independent division of ULYSSES. ULYSSES was founded in 1992 and initially positioned as a provider of management trainings. Later our fields of action were expanded by classical consultation services. Today we support clients of many different branches. The company is specialized on market and business analysis, development of concepts as well as all kind of strategic and operative management consulting. Moreover all aspects of modern human resource management resp. personnel development, the development and implementation of standardization as well as quality assurance programs are completing the portfolio. 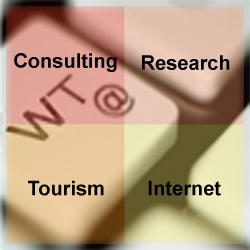 Beside our classic consulting service for the tourism industry, Web-Tourismus was founded in order to keep up with the growing importance of tourism on the internet. Within the tourism industry our consultancy emphases are evenly spread across all sectors. Our goal is to make you more successful! Your success is our main concern and your success is the result of working together closely, intensely and first of all in partnership. We want to be evaluated from your success and therefore we offer the best possible support in implementing all developed measures. Quality and customer satisfaction are our focus, as you are firstly our business partner and only secondly our client.